In celebration of my birthday last week, June and I made an overnight trip to Lawrence, Kansas. It was largely because of recently watching the 1999 Ang Lee movie “Ride with the Devil” that we decided to make the short trip to Lawrence and to do some sight-seeing there. 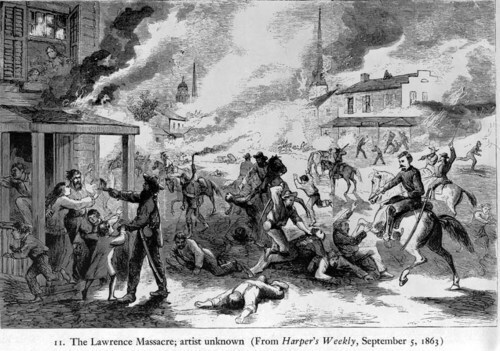 Part of the movie was about the infamous “Lawrence Massacre,” which occurred 150 years ago tomorrow, on August 21, 1863. That event, also known as “Quantrill’s Raid,” was a guerrilla attack led by William Quantrill. Between 150 and 200 men and boys were killed in that atrocious raid. We re-traced the path of the guerrillas’ rampage, which began around 5 a.m. on that fateful August morning. We also visited the Watkins Community Museum of History, just a block from South Park that was part of the original layout of Lawrence when it was platted in 1854. Watkins Museum houses exhibits from Lawrence and Douglas County—and a new permanent exhibition featuring the events of 1863 officially opened last Saturday. Fortunately, we were able to get a “peek preview” of that fine new $300,000 exhibition. At noon on the fifteenth we dined in the historic Eldridge hotel. On that site, the Free State Hotel, a well-fortified structure built by the stanch anti-slavery Massachusetts Emigrant Aid Society to receive anti-slavery settlers as they arrived from the east, was completed in May 1856 – and burned down the same day by the avid pro-slavery sheriff and “ruffians” from Missouri! Colonel Shalor Eldridge rebuilt the hotel, naming it Eldridge House. That building, completed in December 1858, was the destroyed less than five years later during Quantrill’s Raid. But Eldridge and others built it back in 1866. The new Eldridge House was torn down in 1925 and then rebuilt as The Eldridge. In 1970, though, it was turned into an apartment house. But in 1985 it became a hotel again after the top four floors were completely rebuilt and the lobby restored to its original elegance. Before the Civil War started, the guerrilla free-state fighters were known as “Jayhawkers,” and they often clashed with pro-slavery groups from Missouri known at the time as “Border Ruffians” or “Bushwhackers.” After the Civil War, the word “Jayhawker” became synonymous with the people of Kansas. In 1890 when the University of Kansas, located in Lawrence, fielded their first football team they were called the Jayhawkers. Now the KU sports teams are known as simply the Jayhawks. After June and I moved to Liberty in 2005, we became fans of the University of Missouri Tigers basketball team, and we especially enjoyed the exciting games with the KU Jayhawks. Those games were sometimes called “border wars,” though. The more we learned about the real border wars of the 1850s and ’60s, the more uncomfortable we felt. We were not particularly happy when MU transferred to the SEC, bringing the MU v. KU rivalry to an end. But at least we are no longer regularly reminded of those horrendous days when the deadly border wars were fought. Somehow we went through the Missouri school system not learning much about the appalling conflict between the Bushwhackers and the Jayhawkers. I don’t know if that wasn’t mentioned much back then or whether we just weren’t paying attention. At any rate, although there has in the past been intense rivalry between the MU and KU sports teams, and while there is now some economic rivalry between the states especially in the Kansas City area, at least there is no longer actual fighting with lethal weapons. Some things, thankfully, have improved over the last 150 years! This entry was posted in Uncategorized and tagged Border Wars, Kansaw, Lawrence (Kansas), Missoui, Quantrill (William). Bookmark the permalink. That surely was a violent and ugly time! Ride with the Devil was a good movie and the Lawrence scenes were filmed in the old location of Pattonsburg. Interesting that Kansas would use Jayhawks and Oklahoma would use Sooners — but Missouri did not use Bushwhackers!